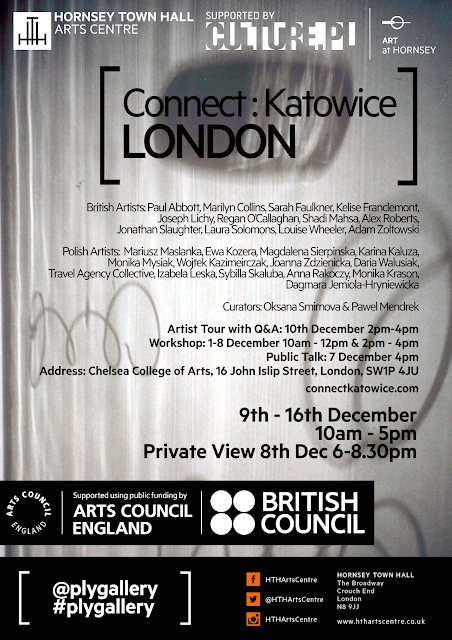 The British-Polish exchange project, supported by Arts Council England and The British Council (Artists International Development Fund) is sharing it's progress from 2nd December at the Ply Gallery, Hornsey Town Hall. This Cross-cultural, creative collaboration, set of workshops, talks and exhibition are an opportunity for the public to visit the working update of the international conversations, gaining insights into the variety of individual pairings underway. A plethora of free events are being offered, where families and all members of the public are welcome. A chance to learn, share and engage with cross-cultures and geographic boundaries. The press release, details about the accompanying public talk hosted by Chelsea College of Arts and fuller information can all be accessed via the website. Image credits: Marilyn Collins and Wojtek Kazimierczak. Previous design support for Connect:Katowice, special thanks, Joseph Lichy. Included design, courtesy of Hornsey Town Hall Arts Centre.